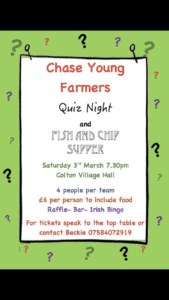 Come and join Chase YFC for their club fundraiser! Quiz Night with a Fish and Chip supper. Raffle and lots of fun and games too! There will also be a well-stocked bar. Tickets £6 to include a fish and chip supper. Contact the top table for tickets or Beckie Phillips.